We’d love your help. Let us know what’s wrong with this preview of The Best of (What's Left of) Heaven by Mairead Byrne. To ask other readers questions about The Best of (What's Left of) Heaven, please sign up. Just when I begin to suspect that I have stumbled upon every author who is willing to experiment with the definition of literature or embrace language at its most elementary and beautiful or try to express something significant without any particular significance, I somehow come across (or in this case, I win) a book or a writer that puts that suspicion to rest. I do not know what happened to Mairéad Byrne's poetry blog (whatever did happen, I can't access it for the life of me without a compute Just when I begin to suspect that I have stumbled upon every author who is willing to experiment with the definition of literature or embrace language at its most elementary and beautiful or try to express something significant without any particular significance, I somehow come across (or in this case, I win) a book or a writer that puts that suspicion to rest. I do not know what happened to Mairéad Byrne's poetry blog (whatever did happen, I can't access it for the life of me without a computer crash), but I am so glad that she was able to preserve most of the work in this anthology. Byrne is not simply willing to tackle poetry in a refreshing avant manner--she is eager to. Each of her poems, be it found or fractal or wild or traditional, provokes the mind and appeals to the heart. Caught and squashed this morning! That was my favorite until I read Sleep ("Be your own boss! "), which was my favorite until I read Where Did You Grow Up? Do you mean why did I grow up? No – where did you grow up? Do you mean how did I grow up? I don’t know why I connect so much with Mairead Byrne. Maybe it’s her diction, or her voice, or her ability to find something suspiciously normal to be wildly funny. The prose poems in the section “Everything is unlikely” are similar to those in Talk Poetry, which is one of my favorite contemporary poetry books. The opening sections “Calendar” and “Everyday Lunacy” are whimsical and provocative, flirt with the reader. There’s a shift in tone and emotion once we arrive at the third section “Found.” I sat straighter in my chair, fully engaged. 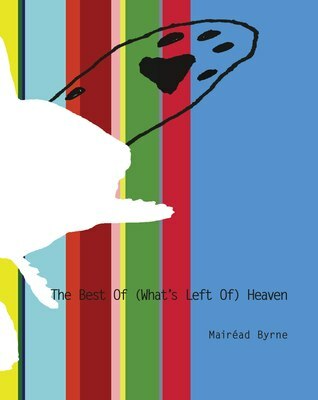 Each line The Best of (What’s Left of) Heaven, a new release from Publishing Genius, is a collection of poems compiled from Mairéad Byrne’s blog, Heaven. The collection is ordered into thirteen parts and there’s a sense of slow build-up, of climb, climax, and linger. Heaven is the premiere travel guide for poets who are curious about found poems, pattern poems, collage. I predict that every few pages you'll go "oh my god I'm allowed to do that?" and journey off to the paint store, the newspaper, a good cuddle, in search of building blocks for your work. In Heaven, Byrne reminds us that there are goodies everywhere and she makes it look easy. She can turn a color into a noun! It's not so easy, but the expedition is fun. This a great read, the kind of poetry book that makes me keep thinking "I want to share this poem! Even with non-poetry people!" Short, funny poems eventually give way to dense, interesting prose poetry, with some collage stuff in the mix as well. Great, great book. These poems are a lot of fun!